A Queen Anne house of great distinction and character. Lister Place comprising the house circa 1720, wrought iron gates and gate piers are notably Grade II* Listed. The house stands in beautiful grounds with separated gardens and walled surrounds. There is a fine range of outbuildings including a coach house, stables, domestic outbuildings and apple store. The principal accommodation comprises on the ground floor: a sitting room with fine mouldings; drawing room with alabaster fireplace and shuttered windows; inner hall; dining room with inglenook; kitchen with AGA cooking range and space for a large table; back kitchen; lobby with cloakroom; and side porch. There is a small basement with three cellar compartments. 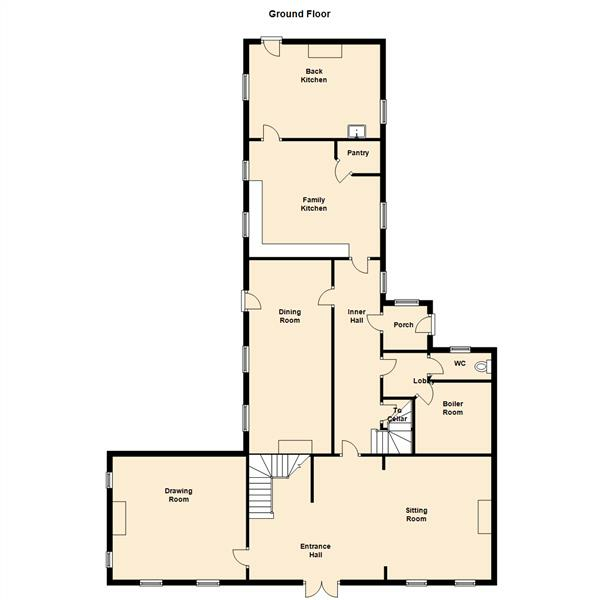 The first floor provides the principal bedroom suite with en suite bathroom and dressing room; a study on a mezzanine floor level, two spacious bedrooms in the front elevation of the property; back landing and bathroom. Winding stairs lead to second floor accommodation with four bedrooms; bathroom and attic room. The village of Brant Broughton is situated eight miles east of Newark, close to the Nottinghamshire and Lincolnshire border. This pretty and genuinely unspoilt village has a variety of brick and stone built properties. The spire of the parish church, St Helen's is noted by Nikolaus Pevsner in his book The Buildings of England as one of the most elegant in Lincolnshire. Lister Place is situated quite close to the church and Church Walk is a quiet no through road. The village has a primary school and public house. Communications in the area are excellent with the A1 and A46 trunk roads crossing at Newark. Many commute from the village to Lincoln, Grantham, Nottingham and Newark. Fast trains from Grantham to London Kings Cross are capable of journey times of just over 65 minutes. The house is constructed in brick with Ashlar dressings, a plain tiled roof with four gable stacks and stone coped gables with kneelers. The fine central doorway is approached by two semi circular steps and has a plain Ashlar surround and segmental pediment. In about 1919 a flat roof tower was built on the north side of the house with ancillary accommodation. In around 1972 when the present owners acquired the property, extensive alterations were carried out and then further alterations in the 1980's under the supervision of Francis Johnson, a well known architect specialising in the Georgian period. He is responsible for the porch, the sitting room alterations with fine mouldings and panels and the en suite bathroom. The quaint top floor fire escape was installed circa 1920 by Lady George Seymour and is just now a decorative feature. Ground Floor - Centre opening glazed and panelled front door. Reception Hall Area - With fine staircase, moulded cornice and panelled dado. Fine archway opening to the Sitting Room. Sitting Room - 5.18m x 4.70m (17' x 15'5") - With fireplace, Jetmaster multi fuel fire grate and screen, two tall box sash shuttered windows with window seats, Pine boarded floor, central heating radiators and useful deep cupboard under the stairs. Drawing Room - 4.88m x 4.57m approximately (16' x 15' approximate - With alabaster fireplace surround, log basket and fine wall panelling. There are shuttered window openings with fluted columns in the south elevation and two tall shuttered windows in the east elevation, Myson heater and radiator. Inner Hall - With blue and red quarry tiled floor, radiator, back stairs to the first floor and door to the basement. Leaded light and shuttered windows. Dining Room - 6.40m x 3.05m 0.61m (21' x 10' 2") - Excluding the inglenook fireplace with Georgian surround and painted inset by the renowned artist, Tom Errington. Two south facing shuttered windows and French door to the garden. Family Kitchen - 4.88m x 4.34m (16' x 14'3") - With heavily beamed ceiling, Pine base and wall cupboards with working surfaces and twin stainless steel sink unit with drainer. AGA oil fired cooking range. There are two windows with an aspect of the garden. Interesting bell system box. Pantry cupboard with old Pine door, thrawl and shelving. Back Kitchen - 4.88m x 3.35m (16' x 11') - With Belfast sink, old fireplace, shelving, cupboard and plumbing for a washing machine. Outside door with a very old box lock and bolts, leaded light window in the south elevation and box sash window in the north elevation. Hatch to the roof space. Lobby - With cloak hooks. Cloakroom - With WC and wash hand basin. Boiler Room - With Pine base units, china cabinet, water softener, cupboards and broom cupboard, Worcester oil fired central heating boiler. 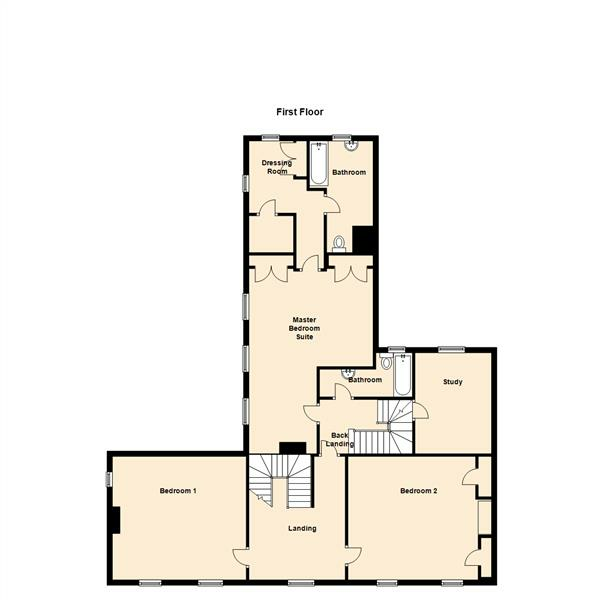 Basement - A winding staircase leads down to the basement area with three cellar compartments. First Floor - The fine, wide and easy staircase has alternative barley sugar, fluted and plain Oak balustrades. The ceiling lantern is included in the sale. Landing - With panelled dado, moulded ceiling cornice, shuttered window and radiator. Bedroom 1 - 4.78m x 4.62m (15'8" x 15'2") - With alabaster fireplace, panelled chimney breast, two east facing deep shuttered windows and a south facing box sash window. Pedestal wash basin and two radiators. Built in wardrobe within the panelled area with interesting early "H" hinges. Radiator. 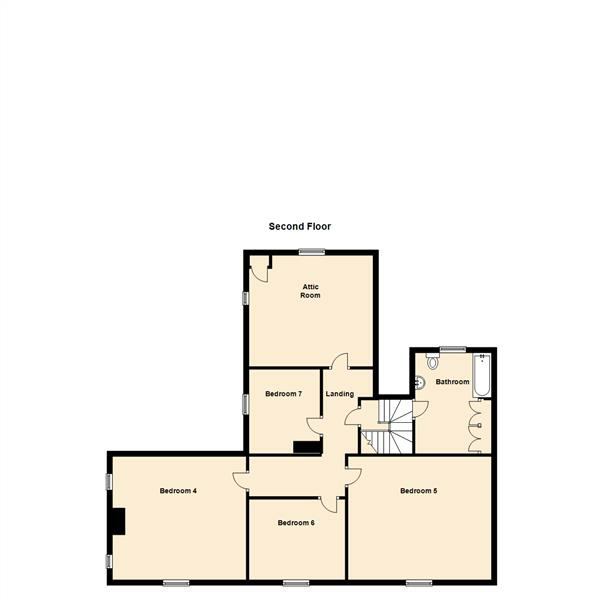 Bedroom 2 - 4.70m x 4.70m (15'5" x 15'5") - Cupboard with basin and cupboard with shelving. There are two shuttered windows in the east elevation, panelled walls, two radiators. Back Landing - With back staircase to the ground floor and the second floor. Bathroom - With coloured suite comprising bath, basin and low suite WC. Radiator, wall tiling and mirror. Master Bedroom Suite - 6.17m x 4.67m overall measurements (20'3" x 15'4" - With three leaded light windows in the south elevation, two radiators, built in wall safe, recessed china cabinet, moulded ceiling cornice, fitted wardrobes with panelled doors, door to the corridor and three steps down to the en suite dressing room. Dressing Room - With walk in wardrobe, radiator. Bathroom - With bath, basin, low suite WC and radiator. Study - 3.66m x 3.66m (12' x 12') - With box sash window, fitted book shelving and cupboards. Radiator. Second Floor - The fine staircase continues to the second floor Landing with glass fire retarding panels and door. Bedroom 4 - 5.26m x 4.57m (17'3" x 15') - With hob fireplace, Pine floor, exposed Oak beams, two leaded light gable windows and front dormer window. Radiator. Bedroom 5 - 4.57m x 4.19m (15' x 13'9") - With dormer window, Oak beams and gable window to a fire escape flight of steps exit. Dormer front window, radiator, fitted cupboards and shelved cupboards. Bedroom 6 - 3.35m x 3.02m (11'0" x 9'11") - With radiator and east facing window. Bedroom 7 - 2.69m x 2.62m (8'10" x 8'7") - With dormer window and radiator. Attic Room - 5.16m x 4.57m (16'11" x 15') - With radiator and dormer window. Bathroom - With bath, basin and low suite WC. Airing cupboard containing the hot water cylinder and immersion heater. Radiator. The Coach House And Dovecote - The Coach House and Dovecote were re-roofed just over 20 years ago. The building is constructed with brick elevations under a pantiled roof. The Dovecote has a Cupola domed turret crowning the roof and surmounted with a weather vane. Games Room - 7.92m x 5.11m (26' x 16'9") - With plastered walls, light and power points. Relatively new floor. Coach House - 5.41m x 4.01m (17'9" x 13'2") - With beamed ceiling and door to the loft area. Stable - 7.92m x 5.00m (26' x 16'5") - With four original stalls, cast iron hay racks, herring bone brick floor, lighting and power points. The Tack Room - 3.73m x 2.49m (12'3" x 8'2") - With corner hob, fireplace, shelving and saddle rack. Old Game Larder - With hooks and mesh vent. Potting Shed - 7.14m x 2.44m (23'5" x 8') - With light and power point. Open Fronted Former Boiler Room - With housing for the PVC oil storage tank. Former Tack Room - Door and steps to the loft area with three rooms. NOTE: The east gable end room measuring 15' x 13'6" approximately and known as the Apple Loft is a flying freehold. Central with front facade of the house, the pillared entrance and stone path with floral surrounds is a lovely approach to the front door. Note: - Garden ornaments including the stone urn, sun dial, pump and terracotta on the buttresses are fixtures to the property and included in the sale. The five stone troughs and stone horses head are also including the the sale. The Chameleon pots and chimney pot are not included in the sale but may be purchased at valuation if required.